Early Spring is a remarkable work on its face, a combination of realistic and abstract elements for the eye to feast on and the imagination to wonder at. 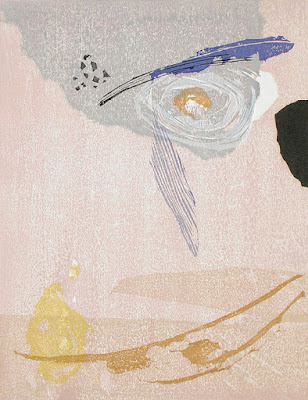 A dash of a primary color that may be a feather and a large thumb-print like black stroke leading off the edge of the paper are the strong marks in a composition of delicate pinks, lavenders, yellows, and amber. Takahashi Rikio (1917-1991) was admired by his peers for his use of these delicate hues associated with the Kyoto practitioners of sosaku hanga or 'creative prints.' Takahashi maintained a consistent luminosity, difficult to achieve in woodblock prints, that has been likened to yayoi, the aspect of calm and elegance of the Japanese spirit. He achieved this difficult feat by printing in extremely thin layers while, at the same time, adding irregular blocks of color that look as though they had been applied with a paint brush. When a wood block is printed on, the texture of the wood grain will appear as if it had been sprayed on the block's surface. This evanescent appearance becomes the background for cuts made by a knife or burin. When two or three colors are overlapped in this manner the grain takes on the look of a layer of gauze. Takahashi began working with abstract forms but the intensity of his concentration always suggested possible layers of meaning. Just so, the longer we look at his images the more we convince ourselves of the inevitability of incident. Takahashi was born in Tokyo: his father was an artist and by the age of seventeen the young man was the assistant manager of the father's photographic studio. In 1944 he was conscripted into the Japanese Navy as a war photographer. After spending two years, 1962-63 at the California Institute of Art, Takahashi's work became known in the West. His own words are worth remembering as we admire Early Spring. "It is impossible to speak about my work while looking at a book or a photographic reproduction of it. It is like scratching an itch while wearing an overcoat. Flat reproductions are different from the actual work." Takahashi Rikio - Early Spring, 1963, Los Angeles County Museum of Art. I don't know this painter, a luminous work. Thank you for analysis. Tania, one fun thing I get to do here is choose my favorite works by an artist! This work is both beautiful and difficult to execute - quite a combination. Glad you like it too.